Fort McDowell - Spend All Day Here! Sometimes, checking out a new destination means hopping around from one attraction to the next. Slow it down and enjoy a variety of activities in Mesa City Limitless® by spending a full 24-hours on the nearby Fort McDowell Yavapai Nation. Work on your backswing at We-Ko-Pa Golf Club – 7:30 a.m.
Book an early morning tee time to enjoy the tranquility of the Sonoran Desert while hitting the links. We-Ko-Pa’s two distinct courses, Cholla and Saguaro, offer breathtaking views of Red Mountain, Four Peaks, and the Superstition Mountains. Named as one of the Best Resort Courses by Golfweek Magazine, it’s a great way to catch some rays and start your day! 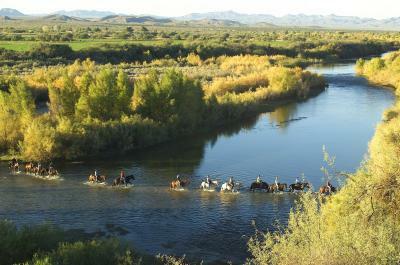 Saddle up with Fort McDowell Adventures – 3:00 p.m.
Channel your inner cowboy/cowgirl and experience the Wild West on horseback, roaming through the desert landscape and crossing the vibrant Verde River. Learn about the surrounding desert and the history of the Yavapai Tribe while you’re high in the saddle. Keep your eyes peeled for wildlife as you’re apt to see coyotes, eagles, roadrunners and more. 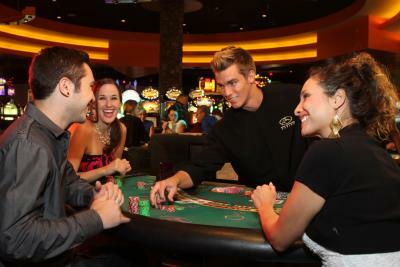 Dinner and games at Fort McDowell Casino – 7:00 p.m.
Luck be a lady tonight! Indulge for dinner at the Red Rock Buffet, then take a chance on winning big at Fort McDowell Casino. With more than 150,000 square feet of gaming options, players are can take a seat at one of the many Vegas-style table card games, bingo or slots. Turn in for the night at Eagle View RV Resort – 11:00 p.m. 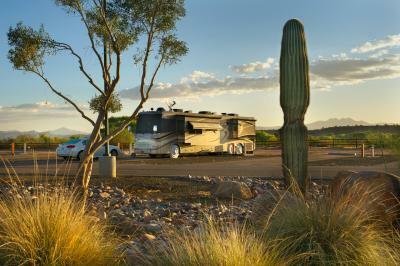 If you are visiting Mesa in your RV, don’t miss the opportunity to stay the night in the middle of pristine desert landscapes. You won’t even need to stay cooped up in your RV during your stay here with luxury amenities provided, like their heated pool and spa and state-of-the-art fitness center. We want to see your day spent at Fort McDowell! Tag #MesaCityLimitless in your social posts.